The Andromeda Galaxy is the Milky Way’s closest galactic neighbor. At 2.5 million light years away, it is rather large, spanning about 3° of the sky (about the width of six full Moons), and can be seen with the unaided eye when viewed under clear dark skies. 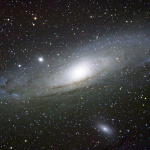 As opposed to dramatic spiral arms that appear in photographs, M31 appears as a fuzzy blob of light, which is actually the Andromeda Galaxy’s core, when viewed with binoculars or a modest telescope. Consult a start chart to locate this object in the Andromeda constellation. If you do happen to view this object under a clear, dark sky, and without optical aid, then the answer to “how far can I see?” becomes 2.5 million light years! The Hercules Cluster (M13) is located between the two western stars of the Keystone Asterism that represents Hercules’ head. M13 is about 25,100 light years from Earth, and was the target toward which the Arecibo message was beamed in 1974, or 40 years ago. This cluster is comprised of about 300,000 closely packed stars, can be seen with the unaided eye in a very dark sky, and it is easily located with binoculars or modest amateur telescopes. I have not tried, but I think that a camera set up described for the Virgo Cluster could easily capture this cluster. The distribution of galaxies within the Universe tends to be in clusters. The one nearest our local cluster is the Virgo Galaxy Cluster. It contains about 1500 galaxies, it is roughly circular when viewed from Earth, and its width is about 8 degrees, or about the width of 16 full moons. Like the stars in a star cluster, the galaxies in a cluster are gravitationally related to one another. Because of the cluster’s large size, and because even the brightest galaxies are quite dim, it is not observable at all with the unaided eye, and even the best telescope can see but a portion of the cluster at one time. The best way to observe the cluster is photographically in a wide field of view. Here is my attempt to photograph the cluster last year: http://www.jrjohnson.net/pages/image_template.php?ID=11. There are about 30 galaxies in this inverse image, and they can be identified with their Messier catalog number (e.g. M86) or their New General Catalog (NGC) number. In a good quality, properly adjusted display, each of the galaxies can be seen as a smudge inside the circle near the M or NGC labels. The source data for this image is 24 full frame, single exposures that were stacked together to reduce the noise (graininess). Each of the individual images were exposed for 30 seconds at f/5.6, ISO 800 using a 70mm lens. Although my camera was guided, an unguided exposure of field this wide should have only very minor star trails, which are caused by the Earth’s rotation during the 30 seconds that the camera shutter was open. The galaxies could be brighter, and perhaps more of them could be seen if a lower f/ number or a higher ISO were used. Experiment with various camera settings, and consult a star chart on line to determine where to point the camera. Find The Whirlpool Galaxy (M51) by locating the three handle stars of the Big Dipper. Take a line from the middle star to the end of the handle. Now take a 90-degree turn toward the inside of the handle, just under half the distance between the two stars. Look for a small, diffuse fuzzy blob. Not impressive, even in a larger amateur telescope, but you will have observed your first galaxy! Images of the Whirlpool Galaxy in Wikipedia reveal that it is a spiral, face on galaxy. While Deep Space Objects (DSOs) technically includes stars, it is generally about nebulae, galaxies, and star clusters. Most are small and dim, so a telescope is needed to see them. Others can be seen with modest magnification of binoculars or a small telescope. Initially I will limit this newsletter to those visible with the unaided eye, and eventually cover those that can be seen with some magnification. It is important to note that DSOs never appear as bright and colorful to the eye, even when using a amateur telescope, as they do in astrophotographs. This is because camera film (in days past) or sensors can gather light over much longer periods of time than can the human eye. Many of the brighter and more interesting DSOs were cataloged by Charles Messier in the 18th century. Messier objects are assigned an ‘M’ number.